The new South West Office provides the same level of expertise when dealing with tree risk management. Where duty of care is a concern for landowners, responsible for taking reasonable precautions to maintain trees in a safe condition, expert advice is often required. The staff at A.T. Coombes Associates Ltd who undertake tree health and safety inspections all hold the industry standard LANTRA Professional Tree Inspection qualification. The team have also obtained the International Society of Arboriculture’s (ISA) Tree Risk Assessment Qualification (TRAQ) and have industry related qualifications up to level 7. 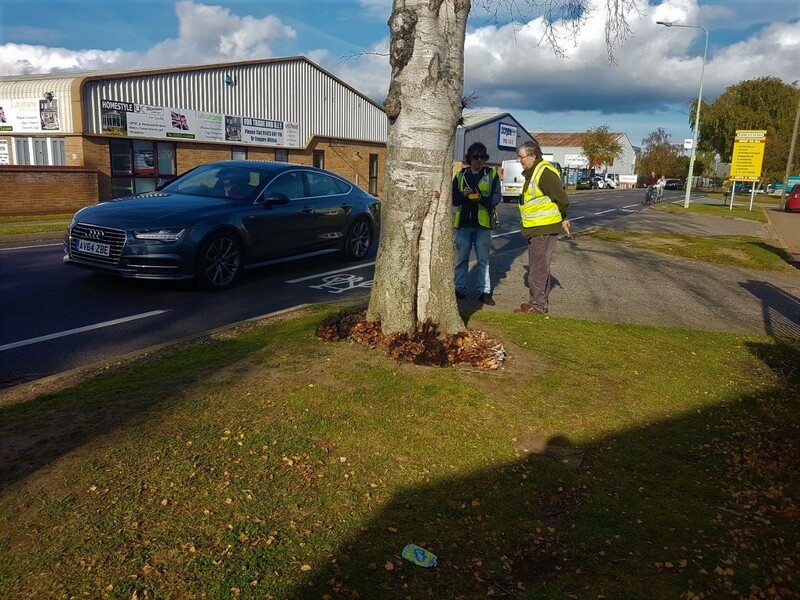 Below (left) a roadside silver birch heavily infected with honey fungus can be seen being inspected by Andrew Coombes and Robert Green. 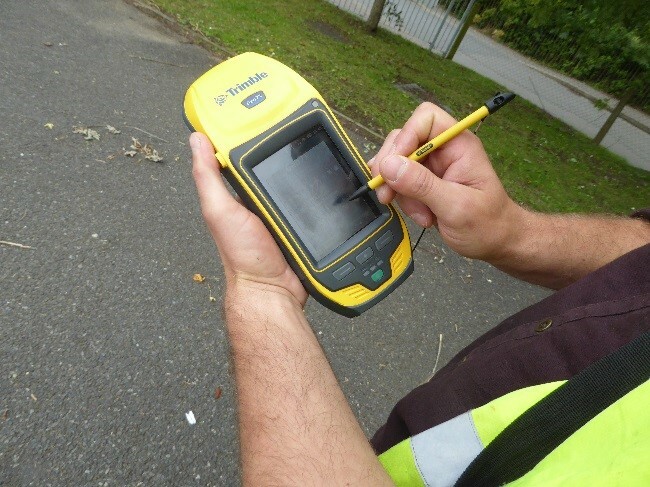 Data collection and handling is also a strong point of the company, as seen above (right) we use a handheld Trimble Geo7X GPS device to accurately map inspected trees and record tree survey data. 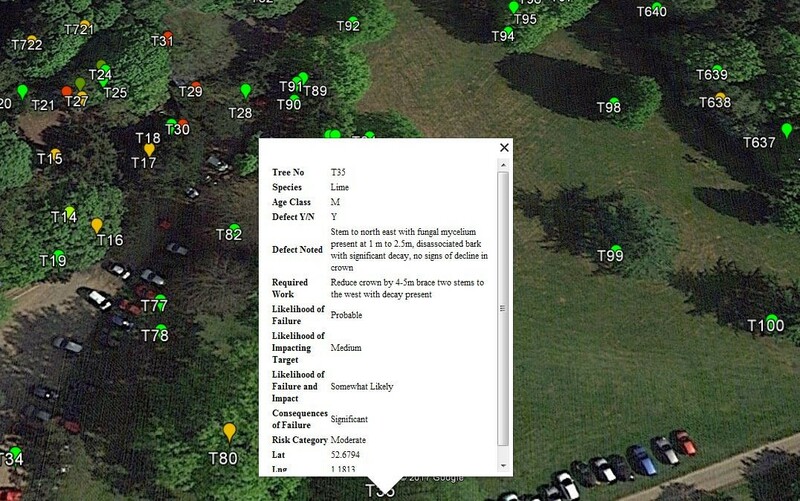 Using our GIS (geographic information system) skills we not only provide the main Tree Health and Safety Survey report including tree survey schedule, but also a file format which opens directly in Google Earth. An example of how this data is presented in the fully interactive Google Earth platform can be seen below. Our standard approach is to prepare a Preliminary Arboricultural Impact Assessment to provide a proper assessment of tree constraints at an early stage. If for example, a developer wants to build on a plot of land with moderate tree cover, the preliminary assessment is essential to determining the most suitable areas for development and how trees of good quality can be incorporated into the design. Taking this approach at an early stage can help to resolve potentially costly issues that may arise later. Once a final design is available recognised methods of tree protection are recommended to resolve potential conflicts during the development phase. A full AIA includes an Arboricultural Method Statement (AMS) and Tree Protection Plan (TPP) at our highly competitive rates. Recognized methods of tree protection are recommended to resolve potential conflicts during the demolition and construction phase in accordance with 'BS5837:2012 Trees in relation to demolition, design and construction – Recommendations'. 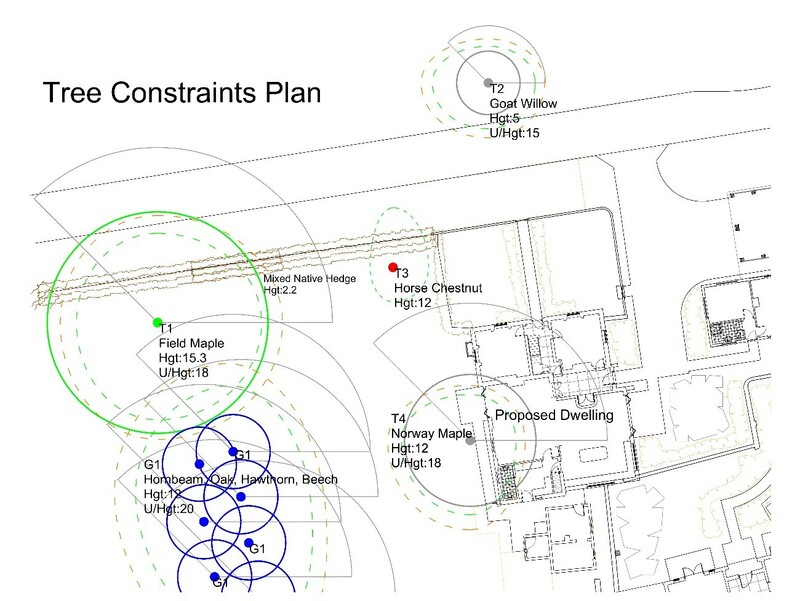 Below (left) shows a snapshot of what our Tree Constraints Plans typically look like, showing tree details with clear interpretation of tree canopies and Root Protection Areas (RPA). 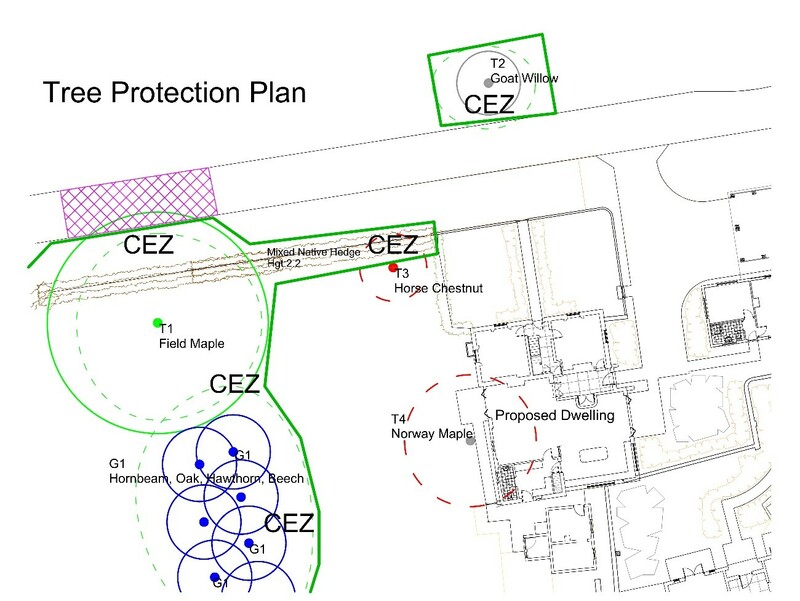 The Tree Protection Plan (below, right) is used to demonstrate to the Local Authority / Council what methods of protection will be used and where. Our current portfolio of work includes projects spanning the country from East Anglia, South East, London, West and Midlands. Tree expert advice will now operate in Devon, Somerset, Dorset, Wiltshire, Gloucestershire and Bristol from our new office in Cornwall. The new office utilizes all the existing software and equipment as the Norfolk Office when completing tree surveys. This includes working in AutoCAD to produce our Tree Constraints Plans and Tree Protection Plans to help achieve clarity within our Arboricultural Impact Assessments (AIA) and the planning application process. We typically provide the full Arboricultural Impact Assessment within 10 working days of instruction following the provision of a design. As part of promotion the company is offering professional and business customers in South West England a 50% introductory discount on the first order made for a limited time only. This offer will end on 31st January 2018. Our expertise is not limited to AIAs and Tree Health & Safety Surveys, we are happy to help with all tree related enquiries. If you would like to get in touch, please feel free to contact us using our online form or by telephone; South West Office – 01208 811320, Norfolk Head Office – 01603 759618.